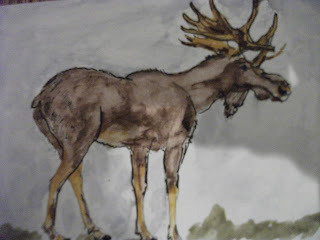 Labels: 'Moose' - Natural History Museum Collins Bks. Yours is also lovely, Gearoid. Is this water colours and ...pencils ? You have various styles! I'll check your old posts. Thanks, Kozue! Water Colour and Ink. Anything goes! I'm thinking of using this little picture as basis for a large oil painting.